Is the carpeting in your office looking worse for the wear? cleaning efficiently and effectively. 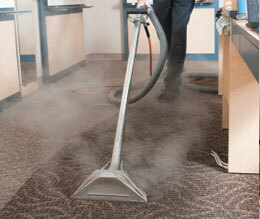 Commercial Carpet Cleaning in Eagan, MN. First, we vacuum the carpeting to remove any loose debris or dirt. Our team will move any necessary furniture to ensure a thorough cleaning treatment. Then, we pre-treat any set-in stains before applying the cleaning solution and using a high-powered machine to shampoo your carpets, working through the building one room at a time. and odors. We understand that our commercial clients don’t have time to wait for days for their carpets to dry, which is why we use the latest quick-drying methods and water extraction techniques after shampooing your flooring. Our team of professional cleaners handle a variety of commercial spaces. We work with large carpeted areas typically found in an office, and can readily handle tile and hardwood floors as well. Each type of surface requires different handling, and our team is expertly trained in all types of flooring so they know the best solution for each product. We can help you restore flooring to its original look and feel, and help to extend the life of the product through regularly scheduled maintenance. Such a plan can save you money in the long run by delaying the substantial expense of replacing large sections of floor covering.